This month, meet Natalie Medina, MetroPets Board Member! I was introduced to MetroPets by Anne who had recently adopted Star, a beautiful 10lb black bunny, when we both attended a House Rabbit Society bunny event. I was very impressed with the MetroPets website and the message they were sending out to the community. I began to volunteer at MetroPets and then later was asked to serve on the Board of Directors. MetroPets is a wonderful resource for pet owners and potential adopters and gives information and advice on various animals. We try and provide as much information as we can on where one can adopt animals, the housing laws, why to adopt, etc. I, myself, have always loved animals. I was 7 years old when my parents bought our first little puppy, a Scotch Terrier called Duffy. He grew up with us and was in our family for 11 years - a right old "lad". One day we heard about a rabbit abandoned in the trash behind a doughnut shop. My sister pleaded with our parents until they finally gave in and said we could bring him home. Of course my mother's first words were. "He will have to stay outside." So he did for 2 days until my mother thought it was too hot and too lonely for him and then we brought him inside and he soon had the run of the whole house. We didn't realise how easy it was to housetrain a rabbit. 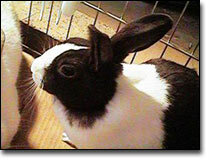 Timbit was a wonderful, affectionate rabbit and he gave us so much love and joy. 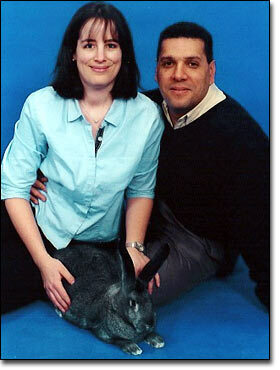 Years later I thought it would be nice to once again have a rabbit as a pet. I knew I wanted to adopt one and MetroPets had all the necessary information that I needed. So our Diego came from The House Rabbit Society, followed later by Rose and Isaac. Sadly, both Diego and Isaac have passed across the bunny rainbow bridge. We currently own a townhouse and share it with a total of 4 rabbits. Blackberry, Chip, Rose and Thumper. Oh, and I must not forget to mention my 2 hamsters Sammy and Anna-Bell. Both mother and daughter hamsters were rescued from Fairfax Animal Shelter. Thumper, the newest additon to our bunny family, came from the Arlington Animal Shelter where there are many more bunnies waiting for a loving new home. Blackberry and Chip were from a divorced couple who could not keep them anymore. Being an animal lover I find volunteering at MetroPets a very rewarding experience.